Fernando Haddad will now be the party's candidate. He also named Mr Haddad as the man to step into the breach. 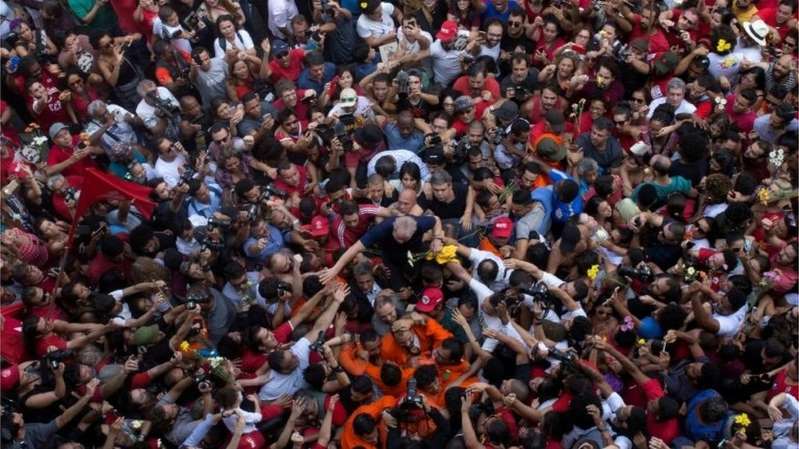 Lula left office with record approval ratings and despite being jailed almost 40% of people asked by polling firm Datafolha said they would vote for him. Fernando Haddad, on the other hand, is a former education minister who has little name recognition outside of São Paulo, where he served as mayor. Born in 1945 into a poor family in the north-east of Brazil, his family moved to São Paulo to find work by the time he was seven. He did not learn to read until he was 10 and started working in a car factory aged 14. A charismatic leader, he soon became the president of the metalworkers' union and then founded the Workers' Party. He served two consecutive terms as Brazil's president before helping his protégé, Dilma Rousseff, be elected. Who will take over his mantle? The Workers' Party has chosen Fernando Haddad to replace Lula as its presidential candidate. Mr Haddad was the minister of education during Lula's presidency and is thought to enjoy his trust. He was Lula's vice-presidential running mate until now. From 2013 to 2017, the 55-year-old, who has degrees in economics and philosophy, also served as mayor of São Paulo, Brazil's most populous city. He faced mass demonstrations against bus fare rises during his time as mayor. Mr Haddad, who has Lebanese roots, is not well known outside of São Paulo and has done poorly in the polls so far. Only 9% of those asked for a Datafolha poll on Monday said they would vote for him. But the Workers' Party hopes people who had been planning on voting for Lula will switch their votes to Mr Haddad. The party hopes the boost he is expected to get will be enough to get him through to the run-off scheduled for 28 October.